Chess.com and Twitch will partner again for season two of the revamped Arena Kings chess tournament series starting next week, Monday, Sept. 17. The series adds an event to give streamers and fans a third date each week, and will culminate with the Streamers Championship in December. The new season will feature $21,600 in prizes, a 44 percent increase in the prize fund from season one. The tournament series will allow both super-grandmasters and casual players to earn cash prizes and grand-prix style leaderboard points to play their way into the season’s big event, the Streamers Championship finals, alone worth more than $3,000 in prizes. All Chess.com members are eligible to join the Arena Kings Streamers Championship season by playing an Arena Kings tournament on the Chess.com live server and streaming their games to Twitch.tv. All players must stream their games to earn cash prizes and Arena Kings Streamers Championship leaderboard points. Arena Kings Season two kicks off with its new format on Monday, Sept. 17, as it moves to a three-times-per-week schedule. Each week will feature three different time controls: 1/0 bullet chess on Mondays, 3/0 blitz on Wednesdays, and 5/0 blitz on Fridays. Continuing its success from last season, this year’s schedule includes three weeks of Royal Arena Kings, with larger prizes and streamer points, allowing the world’s best players to win cash and qualify for the Streamers Championship. The Royal Arena Kings event runs every fourth week of season two. Are you ready for Arena Kings three times per week? 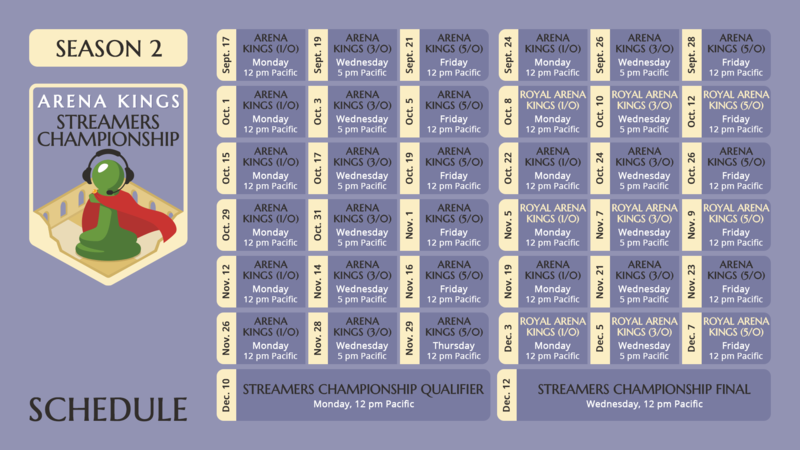 The three weekly Arena Kings and Royal Arena Kings events will form a four-month streaming circuit, concluding with the Streamers Championship, giving chess fans a distinct arena-streaming season to follow and enjoy. After the next Streamers Champion is crowned in December, the series will begin again in 2019. Players must earn their way to the new Streamers Championship qualifier by accumulating at least 125 leaderboard points, earned in the Arena Kings and Royal Arena Kings events for placing and streaming. New for this season: If a player plays and streams enough events, he or she will earn the required leaderboard points to play in the qualifier regardless of over-the-board results. All players must stream their games to any earn cash prizes or leaderboard points. Per our standard identification rules for all cash-prize events, we require all finalists in Royal Arena Kings or the Streamers Championship events to identify themselves. Real names must be listed on your Chess.com profiles, and streamers must appear on camera during their streams or provide verbal commentary of the games in progress to earn cash prizes during Royal Arena Kings and Streamers Championship events. Anonymous players cannot earn prizes in Royal Arena Kings and Streamers Championship events. 1/0 bullet chess on Mondays, 3/0 blitz on Wednesdays, and 5/0 blitz on Fridays. All players must stream their games to earn cash prizes and leaderboard points. All finalists in Royal Arena Kings or the Streamers Championship events must identify themselves to win prizes. See further requirements above. Full Schedule: Click the image for a larger version.